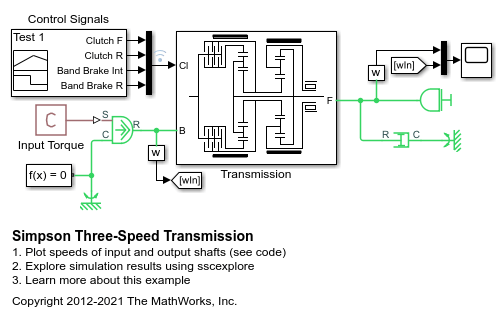 The Transmissions library provides subsystem templates for modeling geared transmission systems with four to nine speed settings. The templates use Simscape™ Driveline™ and Simscape blocks to represent the gears, clutches, and brakes of a transmission. 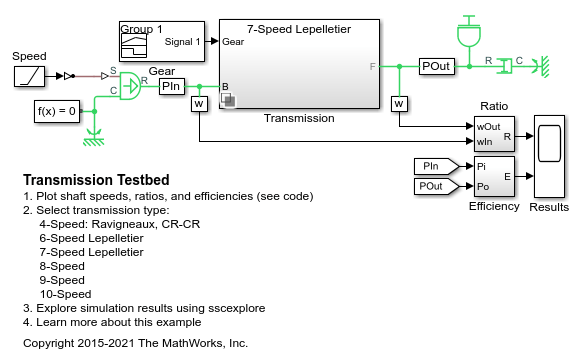 An embedded Simulink® subsystem defines the clutch schedule for each transmission. 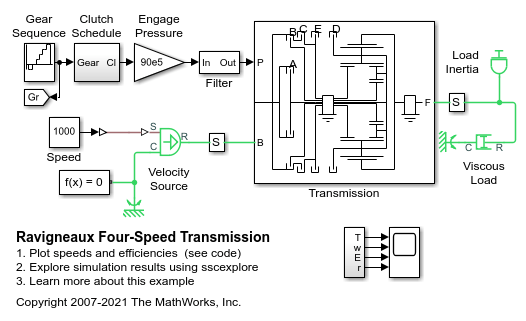 Learn the principles and guidelines for transmission modeling. Lean the rules and guidelines for transmission modeling. Model a simple, yet complete, transmission. 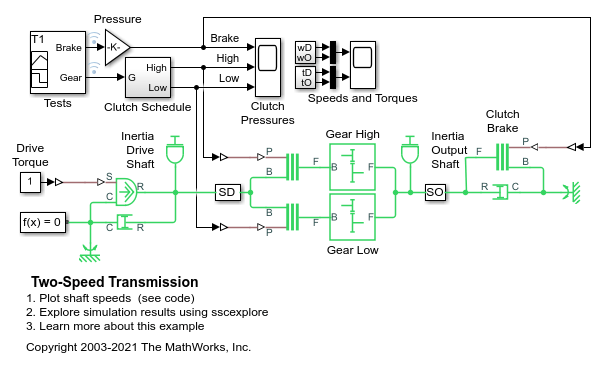 Transfer motion and torque from one shaft and inertia to another using a realistic transmission model. A four-speed transmission with two planetary gears and five clutches. The test sequence steps through the four forward gear ratios, switches to neutral, and then applies a brake clutch to the output shaft of the transmission. A five-speed transmission with a reverse gear. An engine spins the layshaft and the six sets of output gears. To engage the selected gear, ideal actuators move the selector levers connected to the double-sided synchronizers. The position of the selector levers determines which gears are connected to the output shaft. A fixed helicopter transmission testbed. The gasoline engine provides power that is sent to the main and tail rotors through planetary gearsets. The main rotor shaft is considered rigid, and flexibility is modeled in the longer, thinner tail rotor shaft. Blade pitch angle is set directly via a physical signal. Swash plate dynamics can be added using the appropriate blocks in Simscape™ Fluids™. The engine stalls after six seconds, but lift is maintained for some time through the unidirectional clutch. This scheme also allows autorotation of the main rotor in a descending helicopter. A test harness for a Ravigneaux 4-speed transmission. The subsystem uses the Ravigneaux Gear block and five friction clutches to implement four forward ratios plus reverse. Meshing losses are enabled in the Ravigneaux gear. The clutch states required to implement the different ratios can be viewed by opening the Clutch Schedule block. 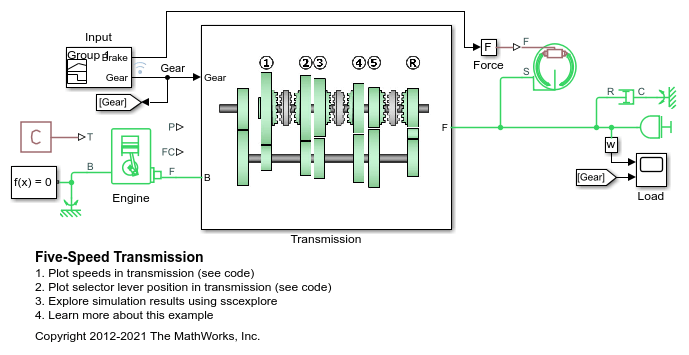 A Simpson transmission with three forward speeds and one reverse speed. Two planetary gear sets are linked with a common sun gear. Two disk friction clutches and two band brakes determine which components can rotate relative to one another which determines the final gear ratio. The Clutch Schedule subsystem shows which clutches and brakes should be locked for each forward or reverse speed. A testbed with interchangeable transmissions. The transmission models vary from classic four speed transmissions to modern seven, eight, nine, and ten speed configurations. The efficiency and drive ratio can be adjusted by varying the components in each individual transmission configuration. The transmission choices are held in a variant subsystem and are selected by either using the hyperlinks in the model or right-clicking the Transmission subsystem, selecting Variant -> Override using, and the desired variant. A simple two-speed transmission. Two clutches control which gear is selected. A brake is connected to the output shaft and can be controlled independently. 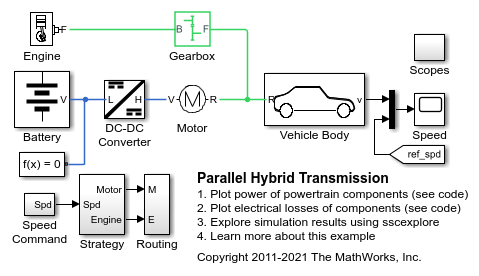 The basic architecture of a parallel hybrid transmission. Electrical power is applied in parallel with the combustion engine power. The electrical torque is applied at the wheel axle, but it could also be applied to the engine flywheel. In this test, the vehicle accelerates, maintains the faster speed, and then decelerates back to the original speed. 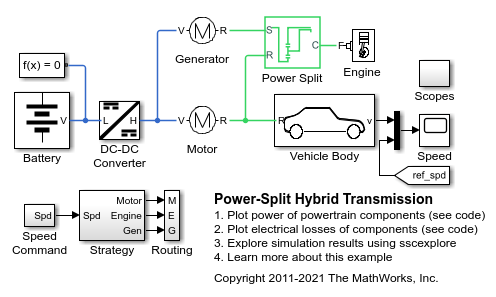 The power management strategy uses just electrical power to effect the maneuver, the combustion engine only delivering the power required to maintain the original speed. 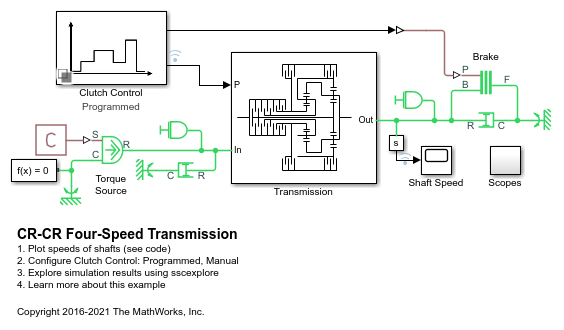 The basic architecture of a power-split hybrid transmission. The planetary gear, along with the motor and generator, acts like a variable ratio gear. In this test, the vehicle accelerates, maintains the faster speed, and then decelerates back to the original speed. The power management strategy uses just stored electrical power to effect the maneuver, the combustion engine only delivering the power required to maintain the original speed. 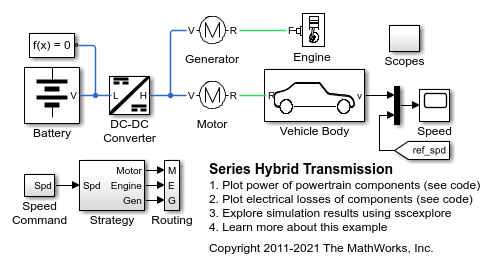 The basic architecture of a series hybrid transmission. All mechanical power from the engine is converted to electrical power via the generator. In this test, the vehicle accelerates, maintains the faster speed, and then decelerates back to the original speed. The power management strategy uses just stored electrical power to effect the maneuver, the combustion engine only delivering the power required to maintain the original speed.